I purchased a bunch of green bell peppers at Sam’s last week intending to use them for stuffed bell peppers, but the more I thought about making stuffed bell peppers the more I just couldn’t muster up the energy to make them. They really aren’t that difficult, although the whole process of getting them to stand up never comes easily to me for some reason, but they are kind of difficult to eat. Plus, my bell peppers always end up a bit… soggy. And, well, that’s just plain ol’ gross. With this recipe because they only are in the oven for about 15 minutes, they still have a bit of crunch to them! 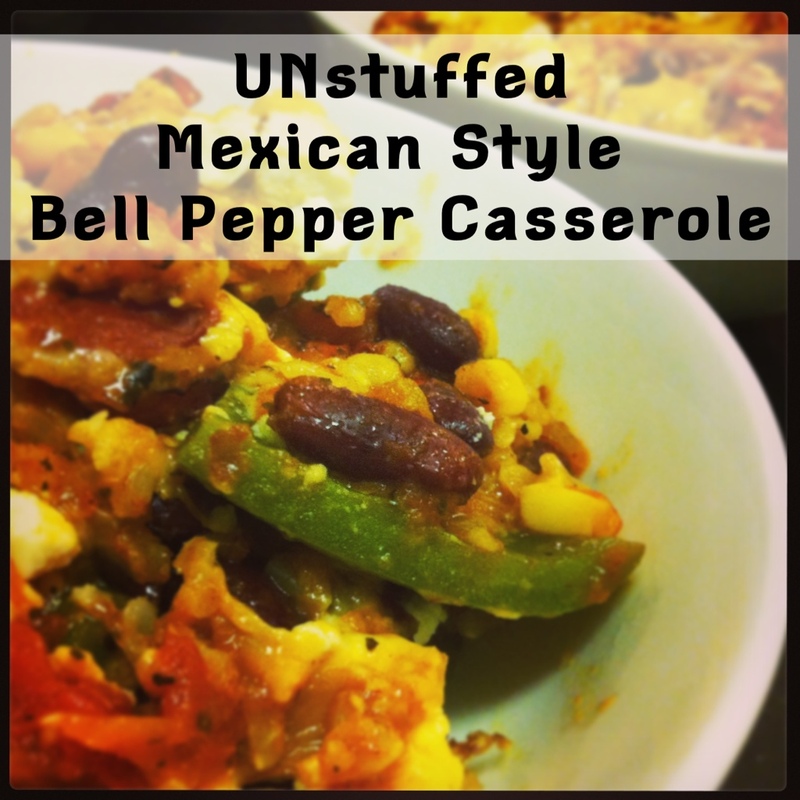 I remembered seeing a recipe for UNstuffed Bell Peppers, and although I couldn’t find it on Pinterest, I did find a couple of others that sorta reminded me of the basic idea, and then I made my own (vegetarian) version! It would be vegan if you just left out the cheese! I would love to try this with black beans as well, but we were out tonight. A question for my experienced cooks: could I make this ahead and refrigerate it? Lightly spray a 9×13 casserole dish. Heat oil in large skillet on medium heat. Saute garlic, onions, dried basil, and 1/2 teaspoon cumin until soft (about 3-5 minutes). While vegetables are cooking, cut and seed the green bell peppers. 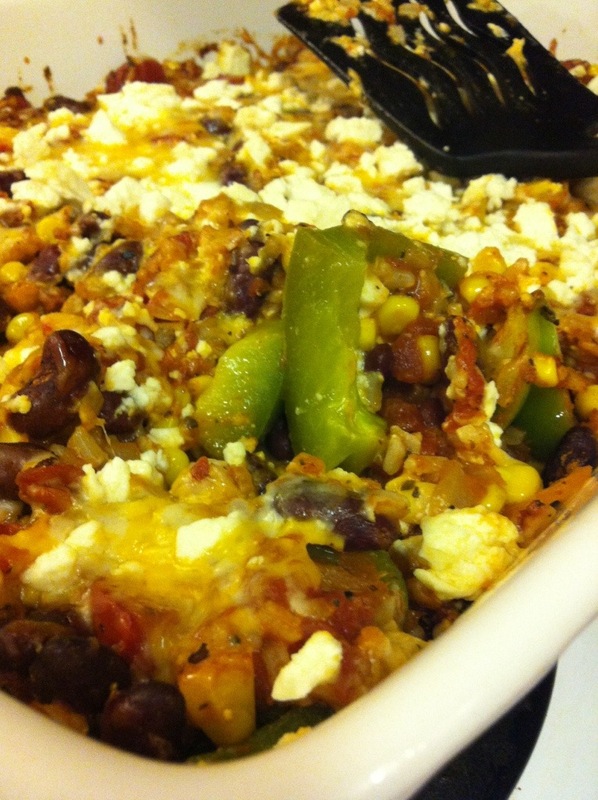 Cut into 2 inch chunks and arrange along the bottom of the casserole dish. In skillet, add fire roasted diced tomatoes and let simmer for 3 to 5 minutes while the juices cook out a bit. 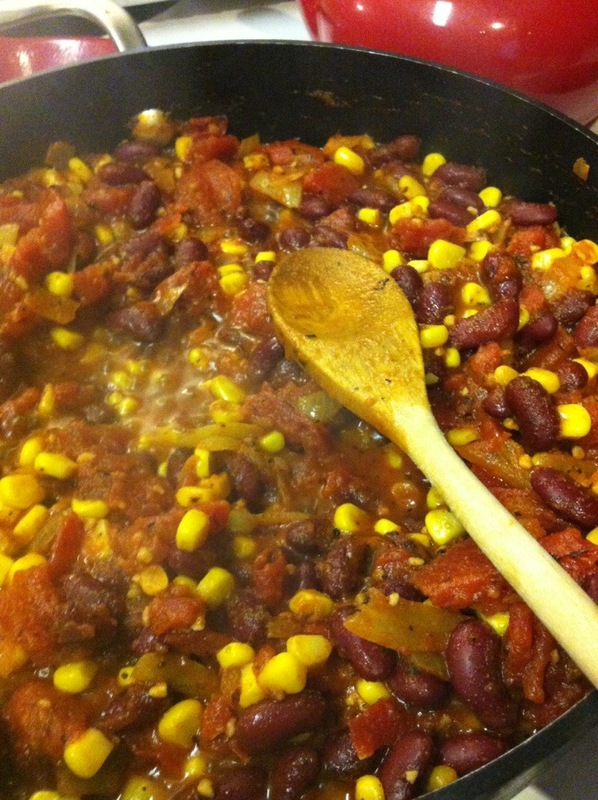 Add in kidney beans, corn, tomato sauce, 2 teaspoons cumin, and cayenne pepper sauce. Stir to combine and allow to heat through. 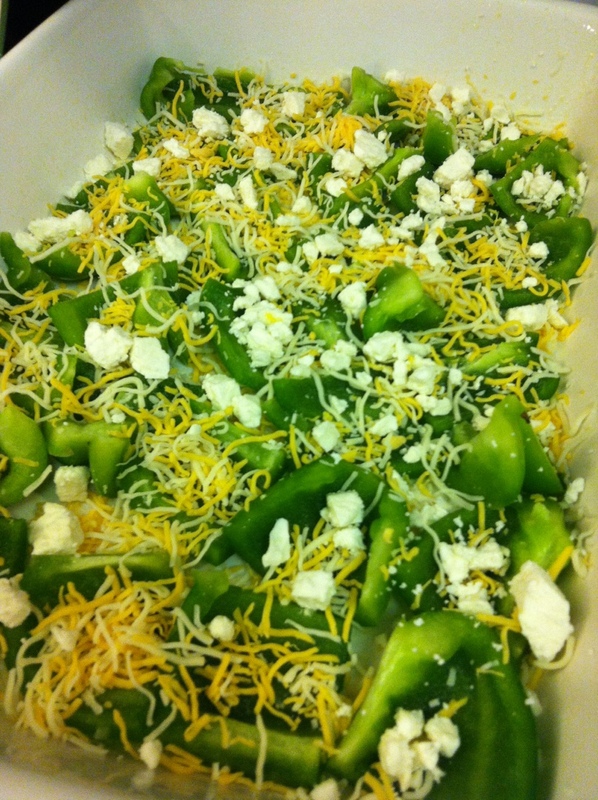 Sprinkle 1/2 cup of colby jack cheese lightly over bell peppers in casserole dish and 1/4 cup of feta cheese on top of colby jack. Spoon the vegetable and rice mixture into the bell peppers in the casserole dish. Sprinkle with remaining colby jack and feta cheeses. Cook at 350°F for 15-20 minutes, or until colby jack is melted (feta rarely looks melted). Serve and allow to cool for 3-5 minutes and then enjoy! As soon as I arranged the bell peppers and saw how pretty it all was, I started to get excited! This step is really important I think because it lets some of the flavors come together without it having to spend a bunch of time in the oven. I could hardly wait when I pulled the dish out of the oven. It looked beautiful and smelled DIVINE! Sounds delish! I will prepare without the cheese though. I bet it will still be yummy. Agreed! I bet if you added a bit more pasta sauce it would compensate for the non-cheese. Is there another alteration that would work in lieu of cheese? I think I’d like to try it sans-cheese next time.